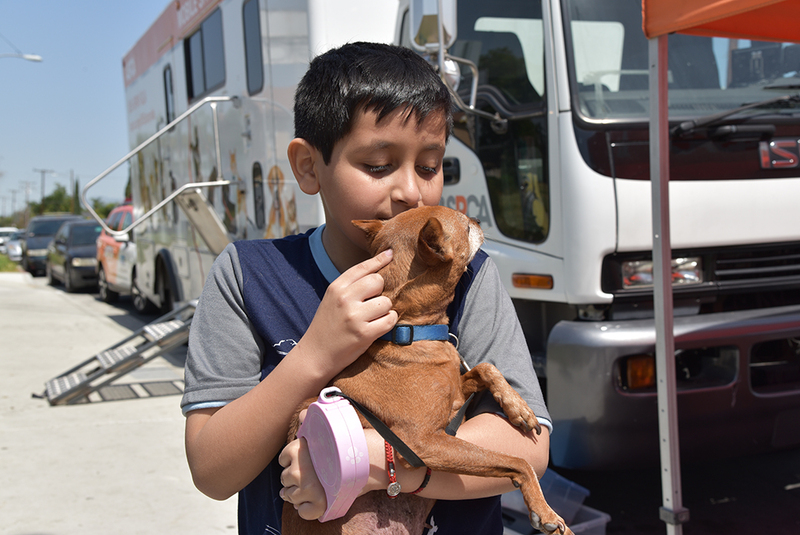 For the first time ever, the ASPCA’s Community Engagement Team in Los Angeles County partnered with Operation Healthy Hearts (OHH)—a non-profit dedicated to reversing the sudden onset of homelessness for L.A. County Residents—at OHH’s weekly resources and outreach event on Friday, April 13, in the community of South El Monte. 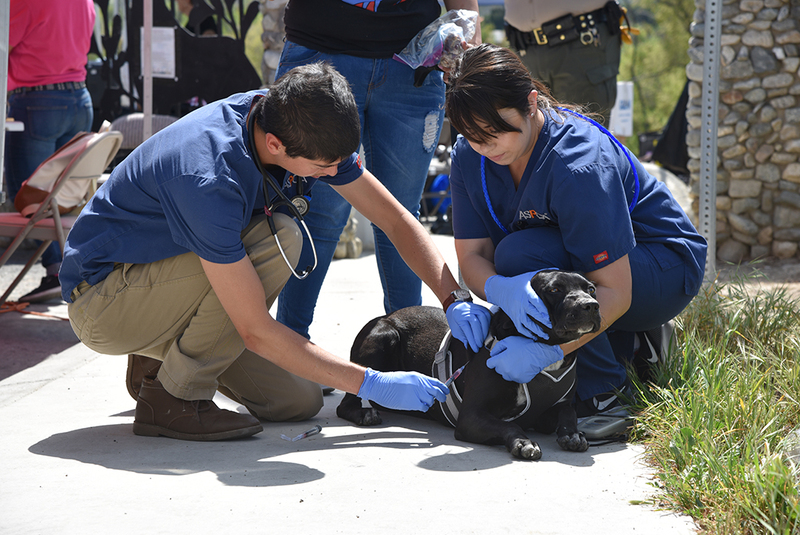 In collaboration with the Los Angeles County Sheriff’s Department’s Homeless Outreach Services Team, OHH volunteers served free hot food to those in need, while the ASPCA provided free vaccines and wellness exams for pets belonging to homeless residents. Tomiko Holling, who learned about the event from OHH canvassers and attended courtesy of transportation from L.A. Homeless Authority volunteers, brought her three dogs for vaccinations and check-ups, including Shorty, an eight-year-old Beagle-mix. During the check-up, Dr. Casey Connors, Community Medicine Veterinarian for the ASPCA, discovered several mammary masses on Shorty, prompting the ASPCA to arrange for further medical treatment. 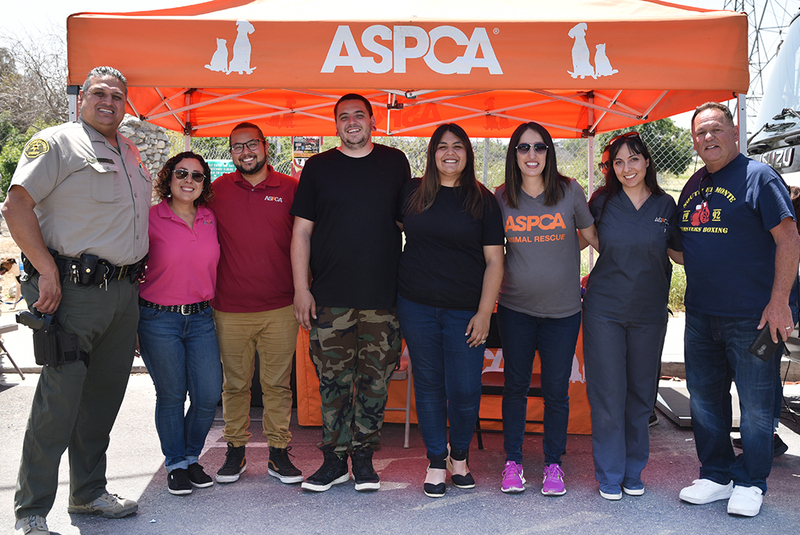 Miguel Ruelas, Community Engagement Manager for the ASPCA, was on hand with several colleagues, including Bernice López, Senior Manager of Community Engagement; Stephanie Bahena, Bilingual Medical Records Associate; and Susana Villa, Senior Veterinary Assistant. Lemanda Loving, who lives in the same encampment as Tomiko, rode in on her bike, toting two crates carrying three dogs. She had her oldest, a 12-year-old Chihuahua named Sugar Baby, nuzzled just inside her backpack. “Her dogs are her life,” says Miguel of Lemanda. He explains that one of Lemanda’s dog was the mother to two others, so the ASPCA set up all three for spay/neuter surgeries in the near future. The ASPCA also coordinated a visit for Sugar Baby with a veterinary partner to treat Sugar Baby’s cherry eye—a prolapsed eyelid gland. Lemanda was “super appreciative,” says Miguel, who considers the event a success. Miguel estimates that half of the ASPCA clients who attended last Friday’s event live in a homeless encampment near the L.A. River in El Monte. That’s where OHH comes in. Founded by Jacqueline Herrera in 2014, the all-volunteer organization canvasses homeless encampments in the San Gabriel Valley, and provides hot food daily to those residents, as well as hygiene items, to-go lunches, clothing and water—as well as pet food to clients with pets. OHH also provides resume writing assistance, substance abuse counseling and other much-needed services. For Friday’s event, the L.A. County Sheriff’s Dept. 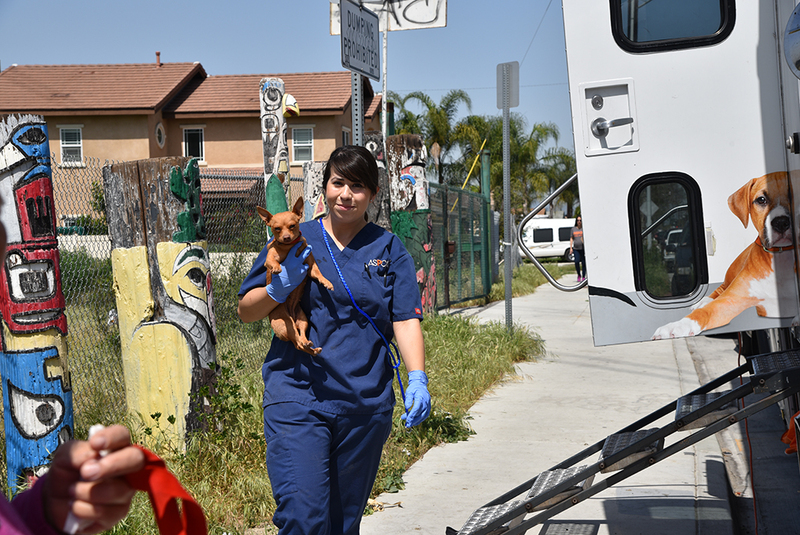 ensured there was space for the ASPCA’s mobile veterinary clinic, or primary pet care (PPC) vehicle. Other service providers on hand included the Department of Public Health, Department of Mental Health, LA Homeless Services Authority, Volunteers of America and Salvation Army. According to OHH’s web site, Los Angeles is the homeless capital of the nation, with more than 50,000 people homeless in Los Angeles County. The No. 1 cause of homelessness—job loss—has caused L.A. County’s unemployment rate to reach double digits for the first time since the 1990s.